Black & white video, without sound, 50 min loop. The words “I lost you again” are cut out of a white sheet of paper. This is fixed on a table in the artist’s studio, so that the sunlight can shine though and project the letter onto the table. This scenario was recorded for an entire hour, so that the sunlight is shifting a little bit. 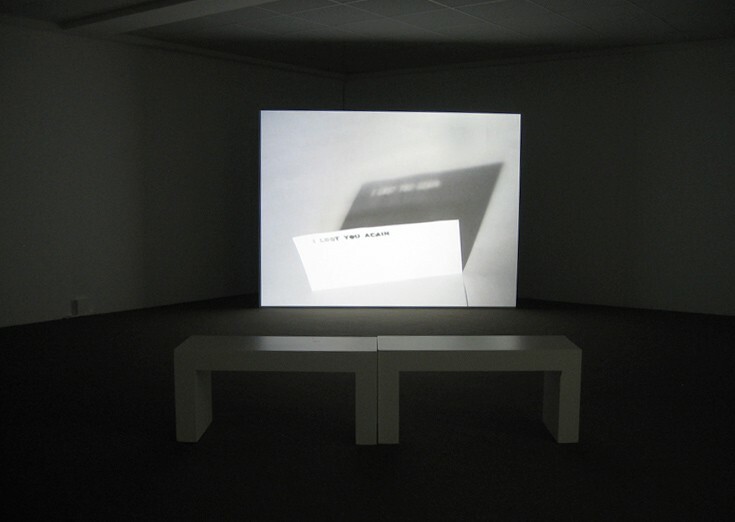 By means of the projected transformation, the interplay of shadow and light is boosted and more distinguishable: as soon as the letters emerge at the wall, it vanishes from the paper – and vice-versa. In this tilting moment of appearance and disappearance the volatility and intangibility of time is demonstrated. The installation also plays with the architecture of the room so that we seem to find another level between light, shadow and concrete wall.